It was hard for her. Is a sentence often uttered. It was and it still is. It’s hard. It’s hard. People think it isn’t. When you’ve money. When you have more than what you had before, they think it stops. It doesn’t. And she knows that now. From a father to a something to a husband. From big man down to little back to big. She was a simple thing. Wide face freckled, bovine eyes. It wasn’t the considered kind of pretty. More dog than cat. The kind of face that wanted you to love it. The kind of girl who worked to make you glad. The mother died when she was only little. The mother small. The mother half the size. The little girl, she always took up space. A long, wide baby. Even then, she watched the faces come from out the blur of world. She’d see the eyes and teeth and wait for smile and she would smile them back. Demanding food with little sorry cries. She didn’t mean to bother. She just needed. There are things we can’t do for ourselves. Little octopus hands. Long splayed fingers teasing at the bottle. As she grew, they lengthened and they learned. They could do things. Shape and rearrange. Sew buttons, mend tears so close you wouldn’t know they’d ripped. You wouldn’t call her a neat little thing, though. There was a heft to her. Not spun from sugar. Maybe worked from clay. Mayhap somebody shaped her on a wheel and liked the job so much they kept on shaping. Big lips. Long legs. Sad eyes. And golden strands. When she grew up, she had her mother’s hair. Her father loved it. Carded it like wool, nursed tangles out with care he didn’t have for scraped knees, bruised elbows. Always looking for an excuse to touch. Soft pat on the head for fresh-baked bread. Millers and their bread. She’d roll her eyes. The two of you is rare. Other people in the village had sisters, brothers. Someone else to share the load of work. She couldn’t help her father in the mill. He took in local boys. They worked okay. He’d take them over sometimes for the dinner. She’d tower over them and give them spuds. Slice flesh and ladle gravy. He’d tell her ‘make an effort’. So she would. One hundred strokes of the brush before bed, and a little oil to make it softly gleam. He’d watch her do it quietly every night. She’d tell him little things about her day, he wouldn’t listen, looking at the gold. He called it gold. Their brains are different, men. At least she thought so. Thought, or maybe hoped. Straw to gold he’d mutter. Straw to gold. His eyes upon her back. The one good thing about her. Every night. Anything that’s fibrous can be spun. She worked with mainly wool, bought from a neighbour who kept sheep for meat. She’d wash it well in hard enamel sinks or little buckets, to take the dirt and lanolin away. The smell of sheep clung still; most of the time, it didn’t bother her. To know that this was part of something living. How dead things out of living creatures grow. The nails. The hair. She’d comb and comb and comb it. Like it was hers. Rough at first to tame, then gentled slow. Focusing on turning fleece to roving. It isn’t straw to gold but it is something. Then the work begins. She knew it well. The calluses on hands that grow from practice. Another thing about her like a man. The size. The want for something more than this. There wasn’t anybody that she talked to in the village, not really. Wool and meat and fruit and veg and fields and cloth and weather. Inoffensive things in voices soft. At Mass, she kept her golden tresses covered with a scarf. Head bowed down, in case they’d think her proud. She liked to do things. A spindle and a whorl. A spinning wheel. She’d spin and spin and think about her life. The roads that she could take. She’d like a baby. Something small and simple she could love. Would love her back. She thought about her husband sometimes. The form that he would take. She couldn’t see a face that looked at hers and loved it. But maybe somebody would like her dowry. Like her father's mill, her wide hips, tidy house. She’d spin before her bed. Fibre to wool. There’s so much you can do with wool. Weave, crochet, knit. It can take any shape once you instruct it skilfully with hands. She thought of all the strands while sitting, spinning. The paths to take. The wool itself can’t care what way to go, but still some roads are softer than the others. She’d rather be a blanket than a hat. Though blankets do not venture very far. Sheep are more than meat she thought. There’s something else to them. That’s not for eating. It filled her heart with something, as she worked. Her father kept on asking about men. Listing names and attributes. Why they weren’t good enough for her. His little girl. He looked above, below her face as he addressed her. It was her hair. He loved to see her hair. The rest an accident. His face her face. When he was doing this, she’d clean and squirm. Not good enough just meant they didn’t want her but she couldn’t say it. It felt too much like failing out her mouth. He’d lost her mother young. To disappoint again, again, again. What sort of things did he say in the mill, the spin of wheel, the drone of heavy work, the toss of water. His voice above cacophony and strain. And every night, he watched her brush her hair. She thought of spinning. Something beautiful. She’d pluck each strand from off her aching head and weave it in a scarf to make him happy. But it wouldn’t. But it wouldn’t do. She saved the strands that fell out in a box. The most important parts of her were drifting off, and she was losing. She was getting lost. He’d list her good qualities. Who wouldn’t want you? he’d say. Who wouldn’t want you? It made her stomach weighted down with threat. No one would and no one will or did. She wasn’t grain to eat, or fire to warm. She wasn’t soft threads woven into silk, but thick rough cables pulsing like muscles on the chests of fishermen. Functional. And maybe someone older? Her father wouldn’t give her to his friends. He’d keep her first. She’d live inside his house forever, ever, until the meat of her was thinned to lace. Until her hands too warped to clean the dust and he’d be gone and she would be a lonely silent thing then even still. The whorl weights the spindle. Holds it down. The wheel revolves. The wood is smooth. She oils it sometimes so it doesn’t splinter. 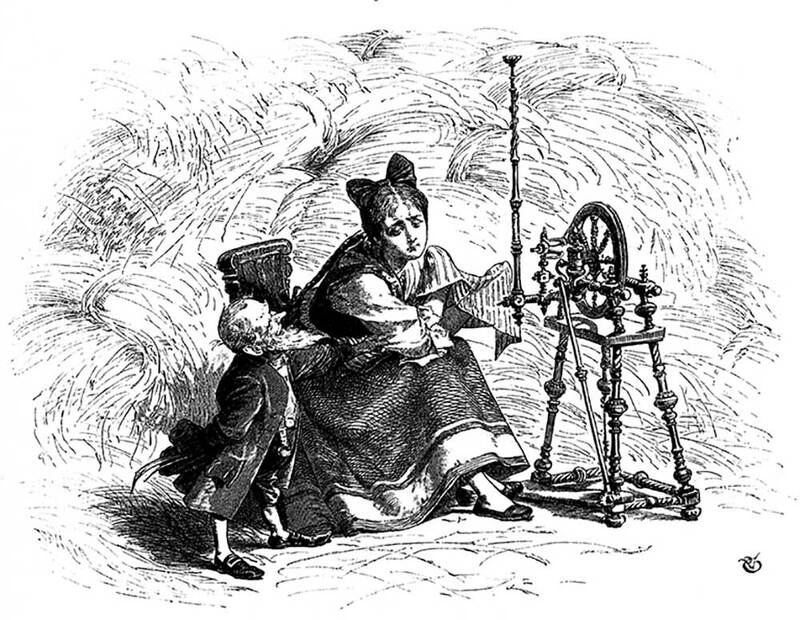 The spindle was her mother's. Smaller hands than hers manipulated it before she quickened, grew. A twinkle in their eye. An unspun oily creature. Her father’s voice the only thing that lent her grace, finesse. And even then. They both knew he was lying. Speaking of a corpse and not his child. One evening, she was rubbing cracked hands soft again with butter. He stumbled in. His face was flushed with drink and pale with fright. A piebald, dappled man. She sat him down. What is it? You can tell me. And when he told her, she wished he had not. A man inside the tavern, making comments. He’d spoken up, but in his cups the straw to gold had turned to something else. A magic power. Something like a witch. She felt the lick of flame against her boots. Her face drained white as his. You need to do it. Need to learn how. He blinked at her. Your mother had a way about her. Something in her blood that called for help. You need to find that love. To save us both. His fat face gaunt. I am a boastful man. And I am stupid. But it will be us both who pay the price. She looked at him. He drifted into something then, a waking sleep. He asked her for more ale. She poured it, left him. Went up to her room and slapped her hands against her stupid face that wasn’t lovely. She slapped her arms until the blood rose, swelling like a tick who’d glutted long. The spindle sharp. And could she use that thing to hurt a person? How thick a rope to spin to end a life. How deep a wound. She sat upon the mattress and she stared and stared until her eyes were dark. She set to work. Down to the stable for a bundle of straw, the freshest and the brightest. She cleaned it and she set it out to dry. Best to prepare. In case. In case. In case. They’d burned a girl two towns over, winter before last. For stealing milk. She’d turned into a hare they said, and suckled long from all her neighbours’ cows. A woman to a hare. How would that work? she’d thought. Did she have to comb her body out into another, fibrous shape and weave herself into another form? Black-tipped ears and smacking lips and teeth. There are so many things inside the world. Horrid, grasping things. And was she one? Is the lack she always felt inside her a sign of something broken, something wrong? Could you unfurl your life she wondered? Straw or no? Could you spin yourself to something else? The basis for another kind of cloth. Something a little softer, even pretty. She smoothed her hands along her skin and slept. Her father's face inside her dreams was bright. He smiled at her. He took her hand and smiled. A knock came at the door as morning broke. It was a broad man, and he wanted to speak to her father. She woke him at the table, splashed his face with water from the jug. He spluttered and he smoothed himself and stood. They murmured as she waited in her room. She could hear the low hum of their voices. The harsh step on the stair did not surprise her. She knew that they were talking about her. Exchanging goods for services. Her father’s face was bright with cheer and panic. He told her if she spun straw into gold the prince would wed her. If she didn’t, both of them would hang. His mill and life forfeit. His eyes shone wide. It didn’t matter, though. She could do it. She wouldn’t kill her ageing father, now. She opened her mouth and closed it. Again, again she did that, like a fish. There wasn’t air to gasp. The broad man took her on a journey. Straw and spindle wrapped in velvet cloth, inside a chest. Inside the carriage. Her thoughts raced and her feet tapped and she ratted at her soft and golden hair. She picked at shards of white skin round her nails. Made a little pile inside her lap and gathered it and blew it out the window. She saw disgust on the broad man’s face. She met his eyes and smiled. It wasn’t pity. Hours passed. The castle loomed before them. Spindle thin, the turrets sharp as pins from out a fat fort-cushion. It grasped the sky. It was an angry thing. And what would this prince be, who wanted gold, would marry her to get it? She didn’t open her mouth to ask. She knew from their expressions they despised her. She was just a job they had to do. Another thing upon a daily list of trials and troubles. Soldiers didn’t care about the people in the villages, she knew it. Protecting those who mattered was their job. She rubbed her hands. She wished that they were softer. She wished she had her mother’s body, face. A pretty woman can take certain risks that she could not. Rough fingers through soft hair. She raised her shoulders, drew herself to her full height and sighed, and followed them into a tunnel. The room was dark, the walls were stone, hung with large tapestries, and tall new candles. She smelled the beeswax and the absence of dust. There were twelve chests of straw beside her. A tray of bread and wine on a low oak table. The air felt almost warm. The soldiers dropped her tools right at her feet and stepped out of the room and locked the door. She ate some bread and drank a little wine. She took her spindle and her spinning wheel from out the velvet. Organised them, then she set to work. Impossible things happen every day, she thought. Why not to her and hers? Why not their turn? The straw was fibrous, rough; it chipped even her callus-paved fingers, her worker’s paws. She couldn’t tell how many hours had passed. The straw was spun into tidy little bushels. Shining gold, but nothing gold about them. Not that she’d know what it would feel like, really. There was no basis to compare it to. And maybe straw was gold, she thought. They shared a colour. Why not more than that? Her eyes were tired but she was scared to sleep. She had been left with just a little time. She looked at spindle, sharpened little spike atop a spire. Removed the straw and placed her palm on it. She pushed down. Pushed down till thick drops came from out her hand and dappled on the floor and mixed with tears. She closed her eyes. The pain would keep her focused. Spindle sharp and ready for the work. Her father’s face. Her father's hateful face. Why would he try to spin her into sorcery when she was only simple, only her? She smeared the hot blood on her palm. She licked it. And then the nameless thing came out the wall, and called her friend, and helped her. She didn’t know that what it did would work. That she and hers would wear gold cloth and silver. Would live inside the castle. Matter much. She didn’t know the little moving thing she grew inside her would come out so soon. She didn’t know the gush of love she’d feel and then the loss, at the remembered bargain. The servants wondered why she turned her face and wouldn’t look. Thoughts drifting across straw and searching, searching. She only did what anyone would do.